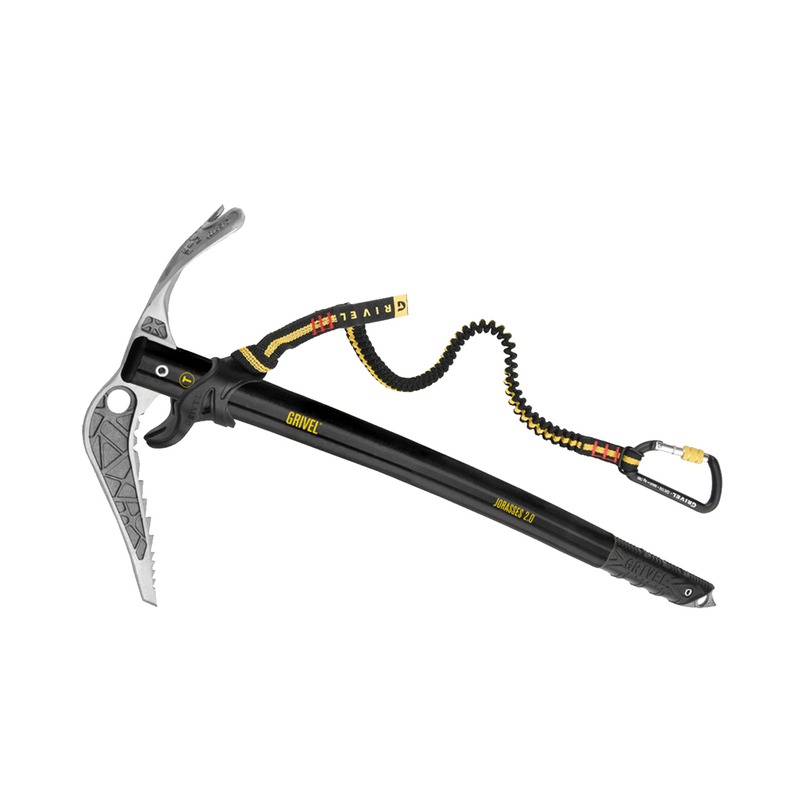 The Grivel Jorasses 2.0 is a hot-forged chromoly steel ice axe designed for general mountaineering and ice climbing, now with the G-bone shaft for increased strength and better grip. It features a reverse curve pick and slightly curved shaft, making the Grivel Jorasses 2.0 powerful when swinging into, and easier to remove from, varied types of ice, whilst retaining effectiveness for plunging, anchoring, and self-arresting. Designed for strength and durability, the Grivel Jorasses 2.0 features a hot-forged chromoly steel pick reinforced by a “net” that follows its strength lines, giving it a much higher resilience to wear and tear than standard steel. The shaft’s G-bone construction (a single groove on either side of the axe’s length) not only increases strength but makes the handle much easier to grip for more ergonomic swinging power. Also, the Easy-Slider hand rest - a rest that can slide to the tail end of the shaft when hand support is needed and also slide to the top end in walking mode - protects the hand from violent blows against the wall for better assurance. With an all-round design for general mountaineering and ice climbing, the Grivel Jorasses 2.0 has power and durability with protection and versatility to match, making it as easy to use across varying terrains as possible.